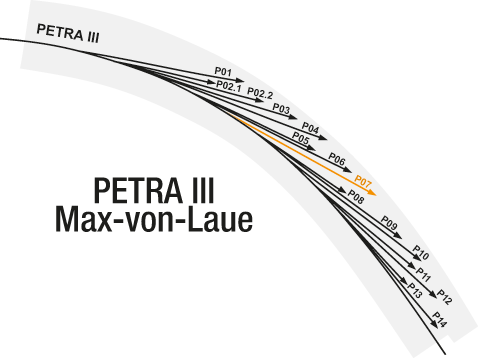 The location of P07 in the Max-von-Laue Experimental Hall is marked in orange. The High Energy Materials Science Beamline HEMS at PETRA III satisfies high energy x-ray diffraction (XRD) and imaging techniques. It is tunable in the range 30 to 200 keV, and it is optimized for micrometer focusing with Compound Refractive Lenses (CRLs). In-house and development activities are shared between HZG (Helmholtz-Zentrum Geesthacht, Centre for Materials and Coastal Research, previously named Research Center Geesthacht, GKSS) and DESY. 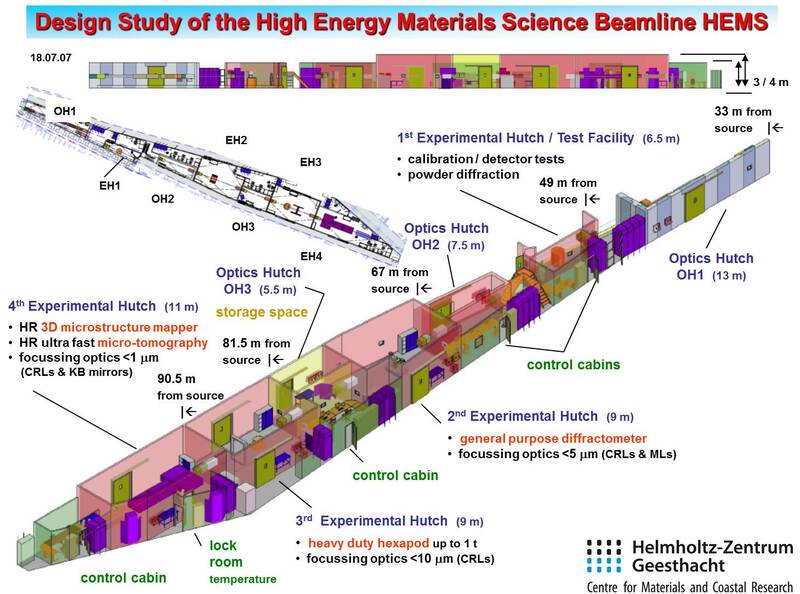 HZG is focusing on engineering materials science applications with two experimental hutches, and DESY operates one experimental hutch for hard XRD experiments. HEMS has partly been operational since summer 2010. Regular user operation started June 2011, the last dedicated instrumentation (3D-XRD grain mapping) has been commissioned end of 2013. Fundamental research encompasses metallurgy, physics, chemistry, biology etc. which are more and more merging. Experiments had been done for the investigation of the relation between macroscopic and micro-structural properties of polycrystalline materials, grain-grain-interactions, recrystallisation processes, the development of new & smart materials or processes, and in situ catalysis mechanisms. Generally, all kinds of matter can be studied with high precision, high stability and low background: surfaces, interfaces, bulk single crystals, powders as well as amorphous materials in a large reciprocal space. Optics for the study of liquid surfaces are also available. Applied research for manufacturing process optimization benefits from high flux in combination with fast detector systems allowing complex and highly dynamic in-situ studies of microstructural transformations, e.g. during welding and loading processes. 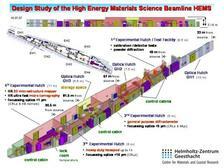 The beamline infrastructure allows easy accommodation of large user provided equipment (e.g. an in-situ friction stir welding device and a laser beam welding chamber built in-house by HZG, or a 10-T magnet for low temperature experiments run by DESY). Experiments targeting the industrial user community are based on well established techniques with standardised evaluation, allowing "full service" measurements. Environments for strain mapping on large structural components up to 1 t are provided as well as automated investigations of large sample numbers, e.g. for tomography & texture determination. 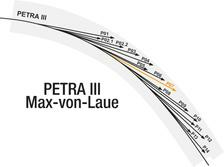 After a first workshop in June 2006 in order to address the future user community and a second workshop in November 2007 in order to optimize the optics concept, the final design for the beamline (P07 in sector 5 of the PETRA III Max von Laue Hall, 47c), consists of a five meter in-vacuum undulator source (U19-5) - currently a standard PETRA undulator is installed till delivery of U19-5 (foreseen in spring 2019 during another extension shutdown), the main optics hutch OH1, an in-house test facility (EH1) (HZG) and three independent experimental hutches EH2 (DESY), EH3 and EH4 (HZG) working alternatively, plus additional focussing optics hutches OH2 (DESY) and OH3 (HZG) with set-up and storage space for long-term experiments as sketched in the picture. Since June 2011 the experimental hutches EH2 with OH2 and EH3 with OH3 had been available for reviewed user experiments. EH4 with its micro-tomography set-up was commissioned in 2012 (absorption) and 2013 (phase contrast), its mapper set-up in the second half of 2013. The Test Facility EH1 is not available for external users.